Confession. Oral feedings use to be a huge battle for us with LJ. It’s really not uncommon for children with spasticity or even low tone. We would spend many hours trying to get as many calories into him as we could. We finally started limiting our feeding times to 30 minutes because beyond that, we would both end up in tears and he would be burning more calories then gaining. No matter how often we tried to feed him, any weight gain was measured in ounces. It was a slow process, but he wasn’t losing weight. The biggest reason we decided on a g-tube (feeding tube) for LJ was because everytime he got sick, he would lose any progress we made. Then, for some unknown reason, LJ starting gagging. The GI doctor originally thought this was a viscious cycle of being a little malnourished (which started to occur after two illnesses in one month). With both of these issues, we felt we didn’t have many other options. I asked questions. I talked to other moms. I knew we weren’t doing it as a convience to us (although it has been a huge stress reliever). We discussed fundos (fundoplications- a “treatment” for reflux) and after some testing and consideration, decided against it (it’s a more invasive surgery then the g-tube). We made sure to stay 5 days in the hospital so he wouldn’t develop refeeding syndrome. I didn’t realize the concerns we had before would be replaced by new ones. In the hospital, we gradually increased his feeds until he was at 6 ounces of Pediasure, 5 times a day. Sometimes we fed him while he slept and he did very well. After a few weeks of being discharged from the hospital, we were told to increase to 7 ounces a feed. That seems to be when the problems began. He started vomitting after the 3rd feed of the day. I thought his feeds were too close together so I cut two feeds down, one to 5 ounces and one to 6. The vomitting continued and even started after his morning feeds. This is where we figured out how to vent him. Venting is basically taking an empty syringe, attached to a tube, that you hook up to his button (g-tube) and let the air out of his tummy. Like burping, but faster. This helped a lot, but he was still vomitting. We tried staggering his feeds, trying to have more time inbetween to digest but we always ended up feeding him at least once while he was asleep. And this is disasterous since we can’t raise the mattress as high as we could in the hospital. I was so freaked out that he’d vomit in his sleep and not turn over or wake up. Unfortuneatley, insurance will probably not cover a hospital or sleep safe bed. Heaven forbid it be convienent for him not to choke on his vomit. We tried to reduce his feeds back to 6 ounces a feed, but his vomitting persisted. Finally, we took out a feeding all-together and the vomitting greatly decreased (we also increased the other feeds to 7 ounces). He’s not getting the calories a nutritionist might say he needs, but the way I see it is he’s getting more then he was before the g-tube and maybe just as much after getting it because of the vomitting. I was never told that a little bleeding from the g-tube site was normal (they finally told us after a frantic phone call). Or how much the actual button could move (quite a bit). Or the granulation (extra skin) that could develop around the g-tube site if the button moves too much. Or that oozing would be the normal. I’m just frustrated that ALL of the medical professionals made it out to be like it would solve all of our problems. If it wasn’t for reading other blogs or talking with other moms, I wouldn’t have known about these issues beforehand. I think if I hadn’t known that there would still be issues we needed to manage, I’d be furious. I hope this better informs parents of what to expect. Despite some of these (minor) issues the doctors failed to warn us about, I’m happy with our choice. LJ has gained 8 pounds since the surgery. He’s filled out, has more energy, and when he gets sick, we’re able to give him the fluids he needs. The downside is his oral feeding skills have decreased, but I think he may have been on this road before the surgery. We’re still working on it and hope to one day not be so dependent on it. Please note that I am not a medical professional. This post was written based on personal experience in hopes to guide parents to be able to ask the right questions of their doctor. We had a wheelchair evaluation yesterday. We actually had the DME Supplier (Durable Medical Equipment) come out in July to adjust LJ’s kid kart and do the evaluation then, but he informed us at the appointment our insurance required us to go into the seating clinic. I thought this was a little ridiculous considering the professional we’d be seeing in the clinic know nothing about my son. He could be having a great day where he’s having excellent head and trunk control when they see him. Which means he probably wouldn’t get the support he needs during his bad days. But whatever makes sense to them, right? As I listed some of the options I researched, I could tell we weren’t going to get anywhere. We discussed the different options in chairs. Wheelchairs vs strollers vs pediatric chairs. I guess we came to the conclusion that the chair we have is the best option for another year or so. Considering my animosity towards the kid kart, you can imagine my frustrations. We talked about future options. The most frustrating part was how insurance kept coming up. It really ticks me off the we have to think about what insurance MIGHT cover instead of what is best for LJ. That’s secondary. And with insurance, nothing is guaranteed. Even if you have a pre-approval, they can still refuse to pay a claim. I found out the other week that when LJ’s insurance was switched to having straight Medicaid instead of having a provider through Medicaid, that coverage DID change. First off, no one bothered to tell me they were switching his coverage. I found this out after we had trouble getting one of his prescriptions filled. But no one would talk to me since they failed to put me on his case when they made the switch. I finally was able to talk to a medical liaison who told me that nothing would change in our coverage. Now we only get 20 visits for therapy per incident. And less coverage for DME. Oh, and we don’t get a case manager, which is insane to me, since according to what I heard, anyone who is switched to straight Medicaid probably needs one more than anyone else. For those of you who aren’t sure what a case manager would do, basically she would know who we are. She would know our story and she would be my go-to person if I had any issues. Instead, I have to wait 30 minutes to get a customer service agent (who have been less the helpful) and then I get to spend time telling LJ’s life story. Over and over. And over. I know these issues are minute. But when I think of other parents who struggles are greater than mine and I get worked up again. There are so many struggles we work through on a daily basis. So many battles we have to fight. And we will stand up to the plate, over and over again. But I can’t help but think it shouldn’t be like this. Not everything should be a fight. And yet, I expect it now. I expect everything to come with a battle. Every doctor’s and therapist appointment. Every IEP meeting or school review. Every time there’s a new prescription or a change in medical care. Every time someone suggest a piece of equipment that could be seen as a convenience. I’ll continue the fight, as I know other parents will. We do what we need to, for our children. I know these posts can seem whiny and can come off like we’re trying to play up sympathy. But it’s a reality we live in. And you know what they say about a squeaky wheel. I have discovered so many special needs web sites this past month. It’s exciting and a little overwhelming! I’d like to continue this edition of Special Needs Link Love (SNLL) every week, but I need your help! Please send me sites you’ve discovered or even your blog link, with a little description, to OurYellowBrickRd@gmail.com. Roa Jo’s Journey– I relate to Roa’s mom, Jennifer, so much! Apparently I had the wrong feed link on my blog and haven’t received the updates, but I’ve fixed everything. Roa Jo is about a year younger than LJ with Quadraspastic CP. I love watching him grown and his mama has a great writing voice! TherExtras– Dr. Boucher site has a wealth of information that I’ve only begun to delve into. She provides information on everything from child development to wheelchairs and standers. You can tell the she works very hard to provide accurate and useful information. The Stir– I love this Cafe Mom site, but I’m mostly there for Amy. Her son, Noah, has Sensory Processing Disorder. Her humor in these often stressful situations is a relief. I’ve laughed and cried with her in the same post. Even if you don’t follow her at her main site (you should! ), you should check out her posts here, every Thursday. Living with Special Needs– Shameless plug! This is actually a fairly new site that I was asked to contribute to. There are many other contributors, all of them with children with special needs. Keep your eye out on this site as it continues to grow! Parenting Children With Special Needs– This is actually a local magazine that launched its first issue in Aug/Sept by, who else, a mom of a sweet boy with special needs. It’s the first of its kind in our area (KC). I’ve been really excited about the next issue. You can check out their issues online or support them and receive them at home for $10. Be sure to read her story here. 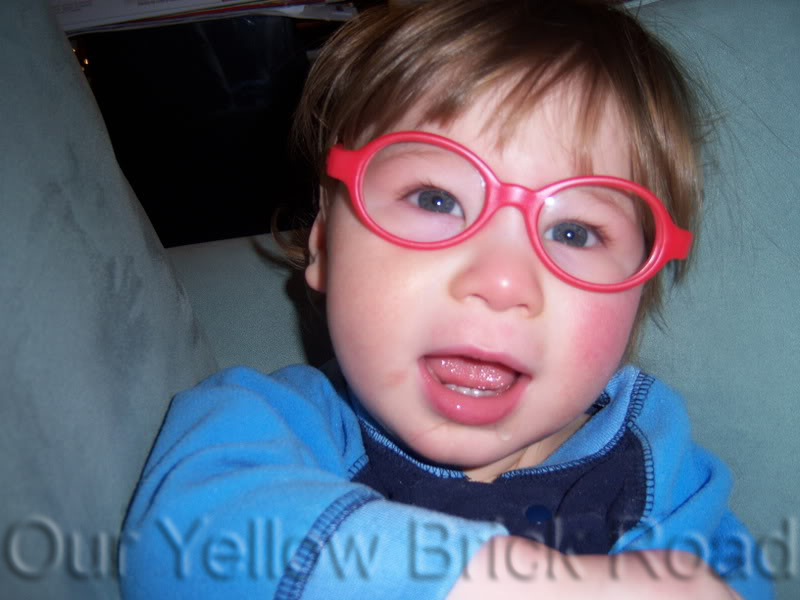 When LJ was a baby (he STILL is my baby) it was easy to overlook his special needs. It was hard to tell how much his hypoxic-ischemic encephalopathy (brain damage) would affect him. Even as he got older, since he was our first, it wasn’t difficult for us to turn a blind eye. We simply avoided others with children similar to his age. I stopped reading baby milestone books and removed myself from milestone websites. I created a faux shelter for us. Today, I dropped off some things at LJ’s school and sat in for an hour, just to observe. I had to leave as I realized I was getting upset. Don’t get me wrong, he’s in great hands. I am confident, despite my pushy-mom attitude, in the teacher, paras, and therapists. As I choked back tears on the drive home, I tried to figure out why I was so upset. I went home and had a good cry, but I still couldn’t quite articulate why I was crying. And then it hit me. This was a scene I have been avoiding LJ’s entire life. In the beginning, I had an excuse because he didn’t like crowd. But now that he doesn’t mind so much, I realize it’s just me. I don’t mind that he’s different. I was never part of the “in” crowd. But I know how hard life is going to be for him. I know he is going to have to struggle everyday. I worry that he won’t have any friends (although he does have one in his class). I worry that I’m not pushing him hard enough. That maybe, if we do that hardest work now, it will be easier later. Today, during story time, they brought LJ to the circle in his stander. He was a part of the group. Yet, a part of me was thinking, why? He has no interest in stories. Couldn’t they be working on something more relevant to him at the same time? But then I thought, well, I really like how they’re including him. I was torn. I’m really glad I don’t have to make those decisions every day. It comforts me to know that the staff loves him. That they see him and not just his disabilities. That he has a cute little friend in a walker that adores him. But it really sunk in today. I’ve known for a long time now that I would have to fight for LJ to have the best. I would have to put a lot of work into finding out what works for him and to make sure he is getting the care he deserves (I’m not just talking school here). I’ve known, watching him in therapy, with the other kids around, that life for him would be a struggle. That life in general wouldn’t be easy. Seeing it, though, made it hit home with me. Seeing him, alongside his “typical” peers, really showed how different he is. It’s not that I feel sorry for him. It’s not that I hate his disabilities or wish he was “normal”. It just hurts. It hurts to know that nothing will be easy for him. It hurts to know that he’ll probably be excluded from many things because he just won’t be able to do it. But it really, really hurts to know that one day, he might understand that he doesn’t get to do certain things because his body won’t let him. Or that he might be excluded because he’s different.